Laboratory tests commissioned by Environmental Working Group have detected hexavalent chromium, the carcinogenic “Erin Brockovich chemical,” in tap water from 31 of 35 American cities. The highest levels were in Norman, Okla.; Honolulu, Hawaii; and Riverside, Calif. In all, water samples from 25 cities contained the toxic metal at concentrations above the safe maximum recently proposed by California regulators. In 2009, California officials proposed setting a “public health goal” for hexavalent chromium in drinking water of 0.06 parts per billion (ppb) to reduce cancer risk. This was the first step toward establishing a statewide enforceable limit. Despite mounting evidence of its toxic effects, the EPA has not set a legal limit for hexavalent chromium in tap water nationally and does not require water utilities to test for it. In 25 cities where EWG’s testing detected chromium-6 — in the first publicly available national survey for the contaminant — it was found in concentrations exceeding California’s proposed maximum, in one case at a level more than 200 times higher. At least 74 million Americans in 42 states drink chromium-polluted tap water, much of it likely in the cancer-causing hexavalent form. Given the scope of exposure and the magnitude of the potential risk, EWG believes the EPA should move expeditiously to establish a legal limit for chromium-6 and require public water suppliers to test for it. Red dots indicate EWG’s test sites and measured hexavalent chromium concentrations in parts per billion (ppb). Size of dot reflects the level found. 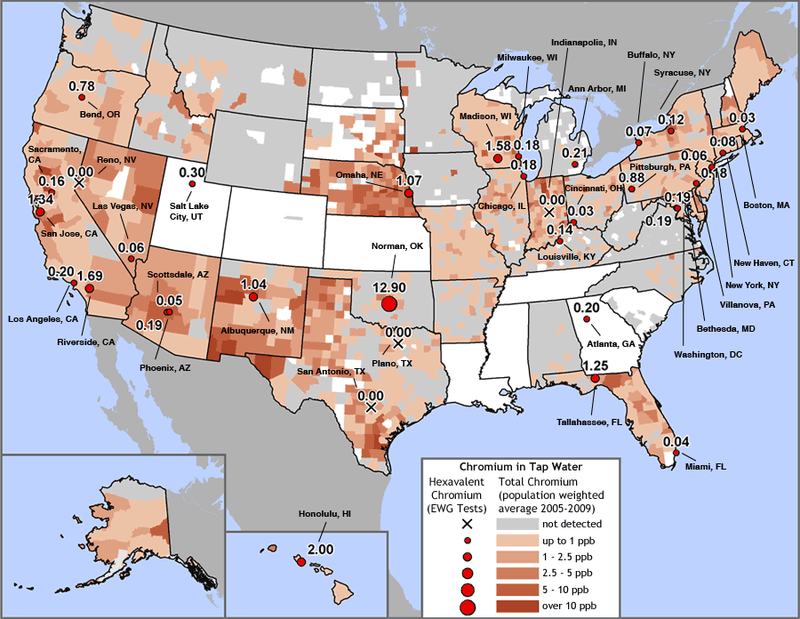 Brown-shaded areas represent population-adjusted average concentrations of total chromium by county, calculated from EWG’s national tap water database (see Study Methodology). Sources: EWG-commissioned testing for hexavalent chromium in tap water from 35 cities; EWG analysis of water utility testing data obtained from state water agencies (EWG 2009).